The Holmes hammermills are light to medium duty impact reduction crushers designed for coal, but should not be used with material harder than a medium hard limestone (Mohs hardness of 5). 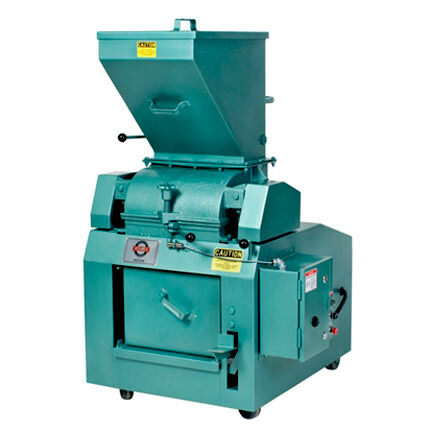 These 10x15 hammermills have a capacity to reduce -6 inch material to minus 10 mesh at a rate of 2,500 lbs. per hour using a 3/16” screen plate. Using a larger screen plate of 3/8” will increase capacity to 4000 lbs. per hour reducing -6 inch material to -4 mesh. The covered feed hopper has a capacity of 1.6 cubic feet (70 pounds) and a manual feed control gate. The cast ductile iron crusher housings are hinged and latched for quick access. The open latch sensor cuts all power. Press the reset button before re-starting the machine, if the stop button has not been actuated. The rotor swing hammers and all 3/16” thick screen plates are heat treated and hardened. Rotor assemblies are reversible (end for end) for maximum hammer life. All screen plates have round hole perforations. Stock perforations are 1/8”, 3/16”, 1/4”, 5/16”, 3/8”, 1/2”, 3/4” and 1” diameters. The 1.5 cubic feet capacity container will hold about 70 pounds of coal. It is sealed to the discharge spout while crushing. A 7.5 H.P., T.E.F.C., 230/460volt,3 phase, 60 hertz motor and Nema 12 magnetic starter are furnished. The starter provides a 120 volt control circuit and overload protection for the motor. About 10 feet of four conductor, rubber covered cable is furnished to connect to your power source. The crusher is mounted on four 4” diameter casters. CAPACITY: 4000 pounds per hour using a 3/8” Dia. perforated. screen plate; 2500 pounds using a 3/16” Dia. screen. Recommended for crushing 6 Inch and smaller material to minus 4 mesh. ROTOR SPEED: 1260 R.P.M. interchange “V” pulleys – 2360 R.P.M. POWER REQUIREMENTS: Stock wiring is 230 volts, 3 phase, 60 hertz, 21 amps. Machine can be equipped for other electrical specifications and for hazardous locations. 010D-003 451, Economy Model, 5 Hp 3 Ph/230-460 V/60 Hz, Does not have the following items that are on the 401 XL: motor starter, overload, cable, crusher enclosure, casters, throw back plate.